Asurint is a full-service background screening company that provides a wide variety of pre-employment solutions, criminal searches, and drug testing services. Asurint’s integration with Bullhorn provides a seamless means of processing pre-employment screenings for your team, offering an end-to-end view of your process resulting in a more efficient workflow. With the Asurint and Bullhorn partnership you will streamline your staffing and recruiting process, while receiving the best customer care possible. Asurint is setting the benchmark for compliance and screening technologies, with industry expertise that reduces your risk in today’s litigious environment. Built-in FCRA redaction settings mean our customizable screening packages provide compliant results. Eliminate guesswork by tracking the delivery of your Pre-Adverse and Adverse Action Letters. 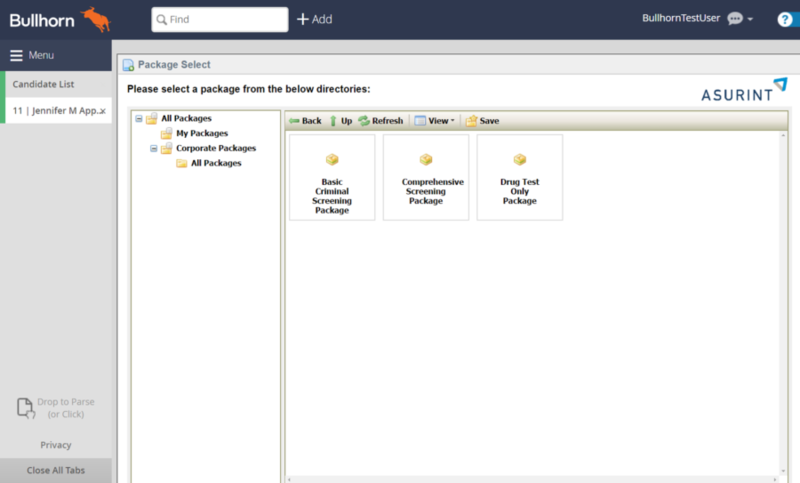 Asurint’s integration with Bullhorn offers flexibility to your team. We know time is money, so we have made pre-employment screening faster and easier for users. Versatile and custom workflow options accommodate the specific needs of your organization, while all pertinent data is securely sent from Bullhorn to Asurint. Amplify productivity and eliminate duplicate data entry. 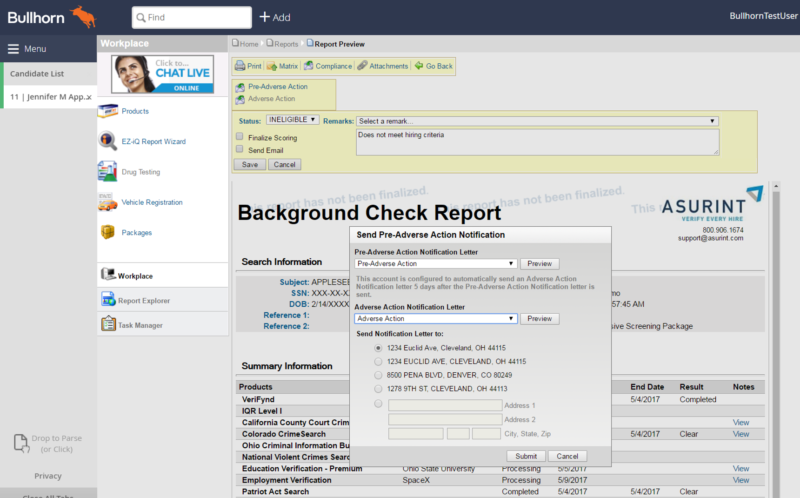 View all candidates submitted in the Job View – or initiate a background check directly from the Candidate View. The integrated drug testing solution effortlessly provides you visibility from order placement to completion. Go paperless with an electronic chain of custody. Disruptive technology lets Asurint do the heavy lifting. We help you choose the best search, while returning accurate results with industry leading turnaround times. We apply a distinctive records adjudication process. This enables our specialists to review and organize thousands of criminal records at a time – and compare each record to the applicant’s entire address history. Asurint yields a 10% higher hit rate than traditional methods of Name/DOB matching alone. We return cases our competitors miss– while effectively eliminating false positives. With the Asurint/Bullhorn partnership, you receive the best customer care possible. Support calls, secure chats, and emails are handled at Asurint’s corporate headquarters in Cleveland, Ohio. 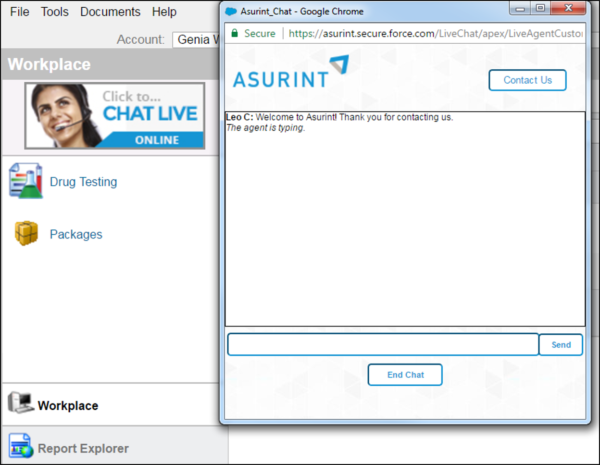 Click-To-Chat, one of Asurint’s most valued features, is available through the integration! Built in FCRA redaction settings mean our customizable screening packages provide compliant results. Eliminate guesswork by tracking the delivery of your Pre-Adverse and Adverse Action Letters.